Description: Thunder Boy Jr. is named after his dad, but he wants a name that's all his own. Just because people call his dad Big Thunder doesn't mean he wants to be Little Thunder. He wants a name that celebrates something cool he's done, like Touch the Clouds, Not Afraid of Ten Thousand Teeth, or Full of Wonder. But just when Thunder Boy Jr. thinks all hope is lost, he and his dad pick the perfect name...a name that is sure to light up the sky. 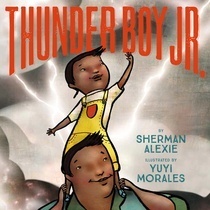 Review: In this adorable picture book, Thunder Boy, a cute Native American boy, hates his name. Not because it’s not a normal name or because he doesn’t like his father, whom he his named after; he wants a name that better reflects who he is. On energetic pages in bold, brassy color, Thunder Boy tries to pick a more suitable name. We watch him as he evaluates his hobbies such as climb mountains, go shopping at garage sales, and powwow dancing in order to find inspiration. Luckily, his dad catches on and offers the perfect suggestion: Lightning. Like the story, the illustrations are bursting with energy as Morales creates playful figures in thick brushstrokes and appealingly rounded shapes, fizz with movement against textured scenes with pops of neon, while fantastic background details enliven the atmosphere. Though Thunder and his father are main characters, the illustrator does not leave out the cool mom on a cool motorbike, and his pudgy sister exuberantly playing along. I really enjoyed the cultural significance of replacing a child's name which was unfamiliar to me. Thunder Boy Jr. would make a great readaloud during story time. Words of Caution: None. Recommended for Grades K-2. Description: Little Maya has a special blanket that Grandma stitched with her own two hands. As Maya grows, her blanket becomes worn and frayed, so with Grandma s help, Maya makes it into a dress. Over time the dress is made into a skirt, a shawl, a scarf, a hair ribbon, and finally, a bookmark. 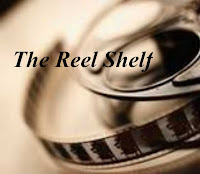 Each item has special, magical, meaning for Maya; it animates her adventures, protects her, or helps her in some way. But when Maya loses her bookmark, she preserves her memories by creating a book about her adventures and love of these items. 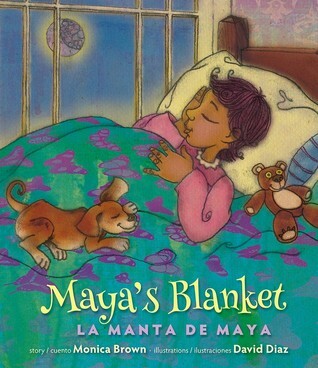 When Maya grows up, she shares her book Maya's Blanket/La manta de Maya with her own little daughter while snuggled under her own special blanket. Review: Inspired by a traditional Yiddish folk song, Maya's Blanket/La manta de Maya tells the story of a child's most beloved possession: her blue and green handmade blanket with purple butterfly stitches. In this charming and heartwarming bilingual story, Maya's grandmother made it to protect her from bad dreams. Yet as time passes and the blanket becomes worn and frayed, it is remade into a dress, a skirt, a shawl, and more. As the blanket is recycled into new creations, we are reminded of its reusable value. This book is a great story time addition for school-aged children due to its sincere and simple writing that translates well in both Spanish and English, the representation of culturally diverse characters, and the underlying message of resourcefulness, imagination, and appreciation for family traditions. I also thoroughly enjoyed how each new rendition of the blanket transformed Maya's ordinary life into an extraordinary one. Created with mixed media, the graphics are illuminating with rich color and texture. Description: Bruce the bear likes to keep to himself. That, and eat eggs. But when his hard-boiled goose eggs turn out to be real, live goslings, he starts to lose his appetite. And even worse, the goslings are convinced he's their mother. Bruce tries to get the geese to go south, but he can't seem to rid himself of his new companions. What's a bear to do? Review: I absolutely adored Mother Bruce! 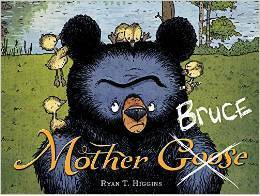 In this laugh out loud picture book we follow the curmudgeon bear named Bruce. He doesn’t like company, sunshine, nor rain. What he does like is eggs and finding new fancy ways of preparing them. Bruce is a very modern bear who uses the the Internet and stove to create his perfect dinner. I couldn't help but giggle as I watched Bruce push his shopping cart through the forest, his local store, to gather his necessary ingredients of honey, salmon, and goose eggs. After gathering all of his essentials, his is ready to cook except it all backfires! The eggs hatch! This results in the grumpiest Bruce yet, and hilarity escalates as he attempts to get the baby geese, who are convinced he is their mother, to leave him alone. Comic illustrations range from full-page paintings to spot illustrations and panels that combine to show Bruce’s schemes to rid himself of the geese result in several laugh out moments. The picture book ends on a silly and sweet conclusion in this picture book of mistaken identities. We love Mother Bruce, it si so darn cute. I have the next book coming from the publisher. We are looking forward to more of Bruce. Gosh, why haven't I read Thunder Boy yet? I know I put a hold on it at the library. I wonder if it came in while I was on vacation, so I missed it. I must check. I also want to read Alexie's new memoir.